Tell a Friend.action has two versions (bundled). Tell a Friend.action that uses a text link and Tell a Friend-img.action that uses an image as the trigger. 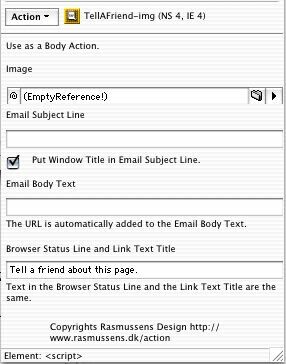 Both Tell a Friend.action versions launches most Email Clients and automatically puts the window title in the email subject line and the URL of the page in the email body. If you want to give your visitor a practical possibility to inform others about your page Tell a Friend.action is a fine way of doing so. All the visitor has to do is to click the link text, write the recipient email address in the email client and send it. You can have text before and after the actual link text and you can disable (By default enabled) the option for window title in the subject line (Window titles can be impractical long). Simply use an image as the trigger, but do not have the same options as it's sister (text before and after). Configure the Action once and for all and Drag&Drop it in the Objects > Library palette (? ), ready to use again and again and for quick editing - saves time.